Arduino is an incredibly rewarding fun hobby and one that is thoroughly recommended. The following 17 Arduino projects and courses will equip you with everything you need to know. Whether you are a complete novice or a bloodied veteran, Arduino could well be the greatest gift to humanity since the discovery of fire. Ok, perhaps a little over-dramatic but it certainly makes for a fantastic and rewarding hobby. The following Arduino projects and courses will give you the skills necessary to get your hands dirty in the realm of electronics and robotics design and assembly. The following examples of Arduino projects and courses are hand-picked and are far from exhaustive. We have tried to cover all levels of experience from beginner to the more advanced Arduino-er. Feel free to add your suggestions in the comments section. Just in case you haven't heard, Arduino is a leading open-source platform that lets you start building your very own electronic prototypes in your very own home. It lets you build both complex as well as entertaining systems through a series of physical and electronic devices. Arduino units are single-board microcontrollers and kits that let you build digital devices and interactive objects that can sense and interact with the world around them. So why not build that little robot companion you've always dreamt of? The possibilities are only limited by your imagination. Here's some food for thought in addition to the 17 Arduino projects and courses below. The Arduino Bootcamp is a fantastic course that will guide you through creating projects from scratch. It gives you a lifetime access to 9.5 hours of in-depth content over 51 lectures. A veteran programmer, Lee Assam, will take you through 15 separate projects that'll make you an Arduino Pro in no time at all. Projects include an Arduino Car, Phone, online weather station and even same game projects. I'm sold already. In case you need some more info, the course will also teach you about ultrasonic sensors, motor drives, servos, transistors as well as build your general competence and confidence. This course is available for a limited time for the low, low cost of only 15 bucks. Grab it quickly before the deal runs out. If you want a little more in-depth instruction, then this course might be a good option for you. This one was created in 2005 by students at the Interaction Design Institute in Italy and it offers access to 131 lectures taking at least 22 hours to complete. This course will teach you, more or less, everything you'll need to know to master this technology. It covers the basic principles of programming micro-controllers, explores the basics of electronics design and takes you on a tour of sensors and components. It will also show you how to connect your Arduino to the net and use tools to build electronic devices. Not too shabby and all for only $21! There is a difference between learning and doing and being thrown in at the deep end. Thankfully this course comes somewhere in between or at least gives you some breathing apparatus. This course will take, or should we say, drag you kicking a screaming, through the process of building a little Arduino robot. Intrigued? Well, you should be, this course will really get you up to speed with the intricacies of Arduino in a fun and challenging way. Sounds great. This Arduino project course is designed to get you deep into the messy details of understanding, designing and building simple projects. You'll need to figure out how the robot works and what it is supposed to do, select the right parts, configure them correctly and of course, assemble and test your creation. It focuses on the iterative process of problem-solving, frankly the best way to learn. It is comprised of 57 lectures with 8 hours of content that will let you gain experience in analyzing problems and designing solutions to them. Get stuck in for only $28! 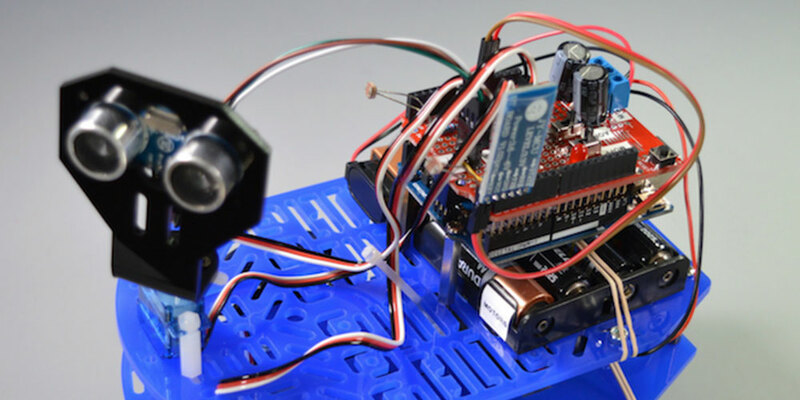 Hot on the heels of the Arduino robot is this great Arduino project. This course will tickle your fancy and uncover the excitement that can be gained from robotics. You'll also end up with a fully functional robot car! Robotics can be a difficult hobby to just "leap" into but mastering it is infinitely rewarding. This mixed Arduino and 4WD Robot Platform course will make the learning curve that little bit more manageable. You'll need to use some Arduino components as well as non-Arduino bits to help you learn the basics of robotics as well as applications for Arduino. Although a bit pricier than other entries on this list it does supply you with most of the bits you'll need. Great stuff and all for $77.99! Well if the other entries on our list are not enough for you, how about taking your Arduino projects to the next level. This course will explore some of the tools that the pro's use and let you claim their power for yourself! The Arduino Uno is a fantastic piece of kit, but it does have limitations. This course will show you the alternatives to the Uno that will let you unlock your real potential. You'll be exposed to some of the best currently available advanced Arduino boards out there. Each one will be discussed in detail with explanations of each's pros and cons. You'll also be shown how to use each one in your projects and become enlightened in what to look for when you migrate from the Uno. This course covers 9.5 hours of content over 72 lectures. All this for just $29! Why not combine the power of Disney, LEGO, and Arduino into one fantastic project? This project is billed as being for intermediate Arduino users and shouldn't take more than around 15 hours to complete. Costs will vary depending on where you source the parts for the final build but if you have a large existing stock of LEGO or, indeed, an existing LEGO Wall-E kit, you're off to a head start. This project will have you either building Wall-E or upgrading your existing kit to learn how to avoid obstacles. This project is a great way to learn to programme through experience and figuring out some electronics basics. Not only is the final project simply adorable but you'll also get to feel really chuffed with yourself for successfully 'Arduino-fying' a LEGO kit. If you want some proper bang for your buck and learn some useful skills why not check out this super cheap three-course Arduino bundle? This course is aimed at those Arduino junkies who want to learn the hard, but right, way. The courses in this bundle are designed to provide an opportunity for students to get their hands dirty in the understanding, design, and construction of some Arduino projects. The bundle combines 3 and 5 above with another course to let you build a mBot. Mbot is, according to the sales spiel, the world's friendliest educational robot around. It is an Arduino based, two-wheeled robot that comes with built-in sensors and actuators. You will, of course, need to program it using graphical programming language. The extra course adds to 3 and 5 above with an addition 39 lectures covering 5 hours of content. You get all of this for the bank-busting cost of $19. Now that's what we call bang for your buck. Do you have a need for some homemade Light Detection and Ranging (LIDAR)? Then look no further. This short little project will give you the perfect mini-application to provide you with your very own 3D scanning, mapping, and laser guidance. According to the project's creator, it should only be attempted by the intermediate Arduino user and should take around an hour or so to build from scratch. Cost's will vary depending on where you source the parts but you'll need an Arduino UNO and Genuino UNO for this one. You will also need a SparkFun ToF Range Finder Sensor for the build. The project's creator will supply you with a handy step-by-step guide accompanied with videos and of course the code. If you love chess and Arduino this is probably the perfect project for you. This project will let you combine your existing skills with some new ones to help you build a chess processor with a GUI dedicated for use with Arduino Mega. According to the creator, this project is suitable for intermediate users and above so good luck. Like other projects on the list, the cost will vary depending on where you can source the required parts. For this one, you will need an Arduino Mega 2560 and Genuino Mega 2560, a 2.8 inch LCD screen, buzzer and 100-ohm resistor. The creator is not a native English speaker so you'll need to be just a little forgiving of his instructions. Other than that this is a fantastic Arduino project that will need a bit of construction and around 2000 lines of code, give or take. Once built all you need to do is beat the machine you've created, that could be more of a challenge! Hot on the heels of Arduino Chess how about your very own Arduino powered Pong Game? Once complete you'll get to play this classic computer game against your very own handcrafted 'computer'. This project is classified as easy by the creator and should take around an hour to complete from start to finish. For this one, you'll need to get your hands on an Arduino UNO and Genuino UNO board and you'll also need an OLED display and other bits so the cost will depend on your ability to wrangle the hardware. According to the creator, it shouldn't really cost more than $15 plus your time, of course. Completion of this simple project will equip you with experience and knowledge in wiring a color OLED display to Arduino as well as experience in coding a game. How about putting your skills to the test by building a fully functional Arduino powered solid fuel boiler? Yes, you read that correctly. Needless to say, this project is not for the faint-hearted and it won't be the cheapest on our list. The creator assures us that this one should only be attempted by Advanced Arduino-ers but why not push yourself if you wouldn't necessarily describe yourself as such. Apart from the obvious need for an Arduino UNO and Genuino UNO, you will also need some specialist sensors, relay shields, and other sensors before attempting this build. Of course, you will also need some additional hardware to build the boiler itself. It should cost around $200 depending on where you can source the required parts according to the creator. If you don't have enough dosh to buy a VR headset like Oculus Rift or you just find it difficult to justify the cost why not build your own? This open-source VR headset should only cost you around $100 plus the time investment to physically build and code the device, of course. This France based team have managed, through their own ingenuity and determination, to do just that and they will share it with you for free (apart from the cost of parts, of course). For this project, you will need an Arduino Due and Sparkfun Triple Axis Accelerometer and Gyro Breakout as well as some other parts. According to the creator, this project shouldn't trouble any Arduino-er who would describe themselves as intermediate and above. Here is another interesting Arduino project for you to consider. According to the creator, this project should take around 6 hours to complete and should only be tackled for those who consider themselves intermediately skilled. Cold brew coffee is, as the name suggests, a method of brewing coffee without the need for hot water. Apparently, it also tastes very different to hot brew coffee. This form of coffee making is rumored to have originated from the Dutch East India Company in around 1602. You could buy a purpose built kit for between $200 and $1000 or follow these instructions to make your own for much less. You will need a mixture of materials to make the brewing apparatus including plastic bottles and tubing but also you'll need an Arduino Uno, Adafruit Motor and LCD shield and power adaptors to enable you to automate the dripping process. This should be a very rewarding project to build for any Arduino enthusiast. Do you fancy making yourself a swimming robotic snake powered by Arduino? Sneel, according to its creator, is "is a swimming robotic water-snake, constructed to explore lifelike, sinuous motion in an aquatic robot. It is designed to navigate unknown territory and extreme terrain." It was inspired by Protei, which is an international project for the design of a fleet of robotic unmanned boats. This project is open-source and once complete it will mimic the motion of a real-life snake. The build will be a little challenging and will require quite a lot of materials, as you can appreciate, ranging from servos to tubing and clamps. You'll also need battery packs, and Arduino UNO and other shields and servos. This one will definitely challenge your skills. For relative beginners, this project should offer you a rewarding and instructive build. You can set the parameters to whatever you desire to light up the LED's depending on whether you want them to indicate "hot", "fine" or "cold". For this one, you'll need an Arduino UNO and Genuino UNO as well as some generic LED's, temperature sensor and other electronics supplies. This is a relatively simple project but one that will let you get to grips with the basics of Arduino and integration of sensors and outputs. For those who enjoy a challenge, you should look no further than this great little Arduino project. It does exactly what it says on the tin. With this one, you'll learn to build the Arduino based lock and setup password protection via an app on your smartphone. According to the creator, this project is for the more advanced Arduino-er and should take around 3 hours or so to complete. You'll need an Arduino UNO and Genuino UNO, HC-05 Bluetooth module and a generic servo for this one. Costs will depend entirely on what parts you'll need to buy and where you get them from. For some parts of the lock, you'll need access to a generic 3D printer of some kind or you could try to make them by hand, of course. Last but by no means least on our list of Arduino projects is a great one. This project will let you build your very own fortune-telling device that mimics the very popular Magic 8 balls of old. According to the creator, this project is suitable for intermediate and above skilled Arduino fans. For this Arduino project, you'll need an Adafruit Standard LCD, Arduino UNO and Genuino UNO, single turn Potentiometer, wires, buzzer and some resistors. Cost for the project will vary depending on where you source the parts, as you'll appreciate. Although the instructions will give show how to set it up, the final product won't be a pleasing to the eye as its older, less technical alternative a real Magic 8-Ball. You might, therefore, want to build some form of a casing to house your lovingly crafted gubbins, or not. There you go 17 interesting and challenging Arduino projects to sink your teeth into. Looks like you're all set to make your journey from absolute beginner to master Arduino-er with this selection of courses and projects. Some of the less technically challenging ones are also great for a veteran looking for some back to basics courses to reinforce your existing knowledge. Unleash you're inner creativity and explore the wonders of Arduino, electronics, and robotics in general with these awesome Arduino projects and courses. Good luck and happy building. Have we missed any great Arduino projects? Feel free to share you own creations or suggestions below in the comments.